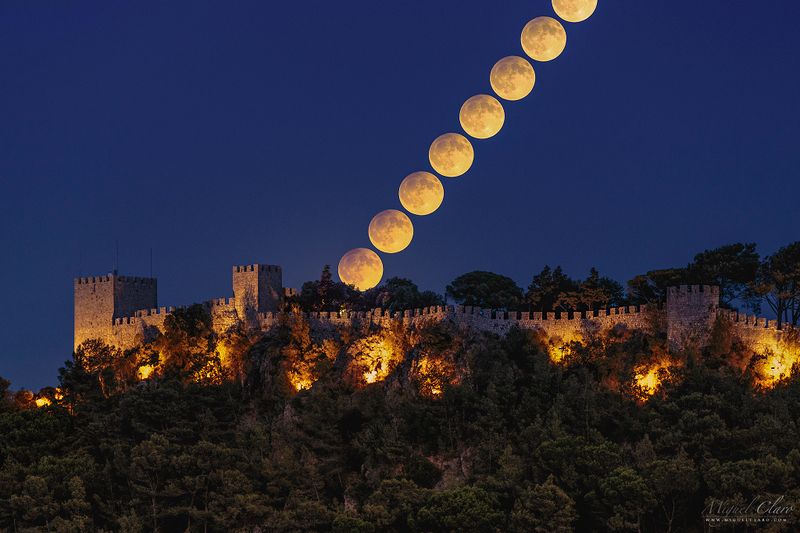 Explanation: A Harvest Moon rises over Sesimbra Castle south of Lisbon in this impressive series of telephoto exposures. Captured at its full phase, the golden Moon was also gliding through the Earth's more diffuse outer shadow during September's penumbral lunar eclipse. The eclipse shading is subtle compared to a total lunar eclipse. Still, the penumbral shadow does darken the Moon's upper limb, the pale shadow receding as the Moon climbs into Portugal's evening sky. In this eclipse timelapse the effect of sunlight and earthshadow on the Moon looks remarkably like the colouring of light and shadow along the illuminated castle walls.